Oceania Cruises must subscribe to the proverb, “A way to a man’s heart is through his stomach” and extend that saying to all cruise travelers -- men, women and children alike! This upper-premium line's new 66,000-ton, 1,250-passenger Marina is an epicurean’s delight with a whopping nine restaurants plus a coffee bar. Of those, five are sit-down, no-fee gourmet restaurants. All have open seating. Marina is Oceania's first purpose-built new build. It's also the line's largest vessel and new flagship. Its first three vessels -- the 30,277-ton, 684-passenger sister ships Insignia, Nautica and Regatta -- were acquired from the now-defunct Renaissance Cruises. Yet to come? Marina's sister ship, Riviera, will launch in spring 2012. But while Marina is Oceania’s largest vessel, she is still nicely entrenched in the mid-sized category. So passengers share her food and wine delights and other shipboard amenities with only 1,250 other guests, not 5,000 as is the case with some new ships of other lines. 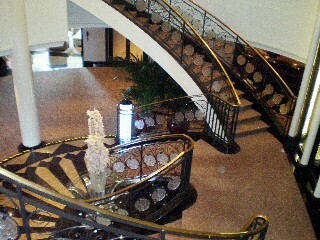 Spanning Decks 5 and 6, Marina’s Atrium is highlighted by a stunning work of art: a grand staircase (shown at right*) designed and crafted by Lalique of French crystal fame. Exuding refinement from every pore, the space makes guests feel as if they have entered a chic European country manor. The grand staircase consists of double carved staircases and balcony, with balustrades of crystal medallions and scrolled iron. Six crystal pillars rise from the landing, as glass elevators glide in the background. 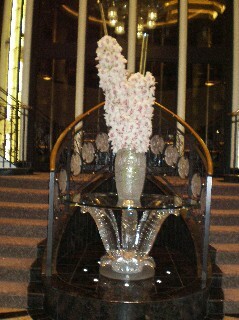 At the foot of the staircase, Lalique’s Cactus table is graced with a Lalique vase holding an arrangement of fresh flowers (see photo at left*). Within the Deck 5 atrium area, guests will find the purser's desk, concierge area, a restaurant reservations deck, and destination services (the shore excursion desk). On Deck 6, the atrium flows into Martinis Lounge. The atrium is certainly the spot to make a grand entrance on an evening at sea – descending the grand staircase on your way perhaps to the Marina Lounge, Jacques or Red Ginger on Deck 5. A modernistic couch (shown at right*) offers limited seating in the Atrium. That said, two chic alcoves just off the atrium offer contemporary sofas and chairs to seat about a dozen people on each side. From the alcoves, guests might listen to a melodic string quartet that plays in the evening. 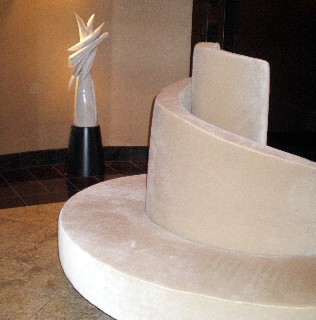 Alcoves are graced by glass coffee tables and art personally chosen by Oceania executives. 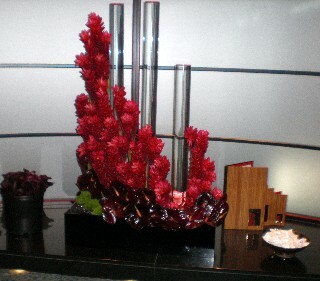 Art throughout the ship, by the way, was also personally selected by Oceania executives. The result? The ship exudes the look of a luxurious private estate. Gourmands not only want to treat their taste buds to delectable dishes at restaurants, but also to learn how to create fine meals to be enjoyed at home. While many ships offer culinary demonstrations that guests enjoy passively in the lounges, at Marina's Bon Appetit Culinary Arts Center, guests can learn how to create wonderful dishes in their own kitchens. Located on Deck 12, the center is equipped with 18 work stations boasting induction cooking tops, sinks, utensils and ovens. So cooking class participants are fully equipped with everything needed to create culinary masterpieces. Bon Appetit magazine selects the chefs who lead the classes, priced at $49 per person. Guests choose from such "a la carte" options as modern Greek cuisine, chocolate desserts or special breakfast dishes. True foodies might choose a package of two or three cooking classes such as "Homemade Pasta" for $149. The ship's daily program lists the available classes. Head for the 600-seat Marina Lounge on Deck 5 to enjoy musical revues by a group of singers and dancers. Also on tap? You'll see a mix of variety entertainment including illusionists, singers, comedians and the like. Seating is theater-style. An eight-piece orchestra both entertains and provides accompaniment for the musical programs. Another happening place is the 240-seat Horizons, an observation lounge with floor-to-ceilings windows. Hint? It's a great viewing spot for the ship's arrival and departure in any port -- not to mention a sunset or two. 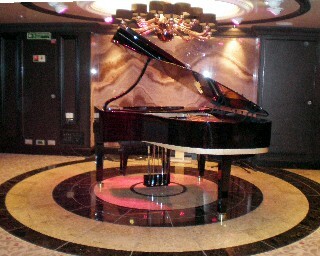 Located forward on Deck 15, Horizons features jazz and swing combos, disco dancing and karaoke sessions in the evenings. The Casino, located amidships on Deck 6, is a good-sized facility for a mid-sized ship. Guests tempt Lady Luck with six tables and 67 slot machines. And if you get thirsty, you don’t have to walk far. The Casino Bar with its backlit onyx bar and Swarovski chandelier and furnishings is just steps away. You'll hear live entertainment here in the evenings. Feeling creative? You can head for the Artist Loft, located across from the Bon Appetit Culinary Center on Deck 12. With a capacity for 24 art lovers, this room sets the scene for classes by artists in residence. Passengers might opt for a class in sketching, watercolor painting or arts and crafts. Check the Currents daily program for the course listings. Other indoor activities include art auctions, bingo, trivia contests and port lectures. One savory highlight is afternoon tea in the Horizons Lounge. It's quite an occasion, with music by a string quartet, dainty finger sandwiches, pastries and scones with clotted cream. Time to catch some rays? 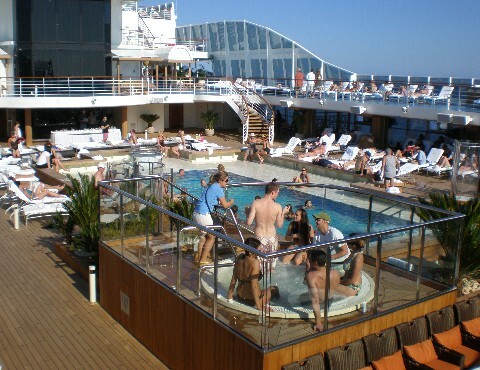 The main pool (shown above*), flanked by two whirlpools, beckons one and all to Deck 12. 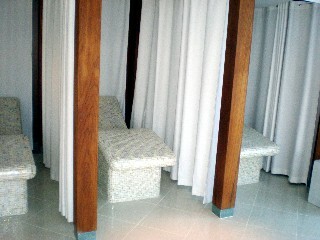 Poolside lounge chairs including Balinese day beds are plentiful. While there are no cabanas, two sheltered sections with loungers and day beds (see photo at right*) are available for free near the pool. The Waves bar and Waves grill are right here, so you have everything for a lazy day by the pool. The Terrace Café with bountiful buffets is also close by. For active cruisers – and those who want to burn the calories from last night’s luscious dessert – the ship has a jogging track, paddle tennis, table tennis and shuffleboard. 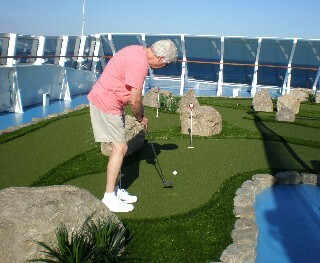 In addition, it offers guests a golf driving range and miniature golf course (see photo at left*). WiFi is installed throughout the ship and available in both staterooms and public areas. The Internet access charge is a pricey 95 cents per minute without a package, so it's advantageous to buy a package. For a 100-minute package you'll shell out $80, while a 200-minute plan costs $140. An Internet Cafe attendant is on duty certain times of the day. 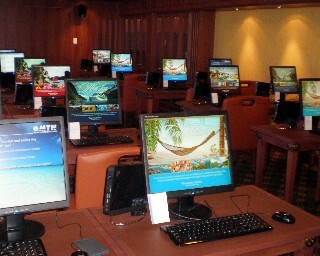 In addition, Oceania offers free classes on Internet and computer use. The ship’s Library is genteel. It's reminiscent of what you might find in a fine British country manor. This space (see photo at right*) boasts comfortable leather chairs, fine woods, faux fireplaces and ship’s models. Instead of one big room, the Library is divided into intimate alcoves. It is well stocked with fiction and non-fiction books. There is no photo gallery or ship’s photographer. So bring your camera! The full-service Canyon Ranch SpaClub is home to 16 treatment rooms, a thermal suite (thermal loungers are shown at left*), changing rooms, lockers and two outdoor whirlpools. Among the many popular spa treatments and therapies on Marina are the Canyon Stone Massage ($215 for 80 minutes) and the Your Transformation Facial ($158 for 50 minutes; $205 for 80 minutes). 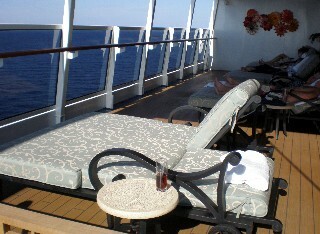 A nice guest perk is that access to the spa’s deck, whirlpools and thermal loungers is free. That said, I'm a big fan of thalassotherapy pools, so I was saddened to see that the thalassotherapy pool available in the spas of previous Oceania ships was eliminated in the design of the new ship. The SpaClub's Fitness Center fields more than 50 pieces of cardio and weight training equipment. Personal trainers are available to design a customized fitness program. This ship is not really designed for children. There is no supervised kids’ program or children's facility. Parents bringing children should come prepared with electronic games, books and toys. And you'll need to supervise your kids 24-7. Hungry? You are on the right ship! The 650-seat Grand Restaurant, on Deck 6 aft, is opulent. It wows with 16-foot ceilings and a light-toned décor that's accented with fine woods, high-quality carpets, granite and marble. Open for breakfast, lunch and dinner, this is a classic main dining room. If I hadn't known better, I'd have thought I was dining at a fine dining room at a luxurious European hotel. Service is attentive. Tuxedo-clad wait staff offer a six-course menu of continental specialties. Menus change daily and feature six appetizers (like a delicious upside-down cheese soufflé with leek sauce) and eight entrée choices – perhaps try the Black Angus filet of Beef Wellington? Those who don't wish to throw their diets overboard should check out the light Canyon Ranch SpaClub dishes. 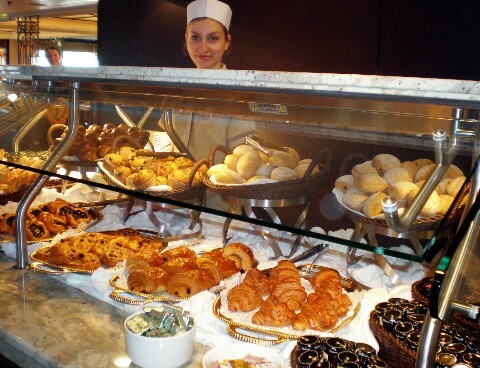 Once each sailing, typically on a day at sea, the Grand Restaurant features the Caviar Brunch (a portion of that is shown at left*). Dishes are made with caviar and other treats; there is no extra charge for the brunch. Two restaurants from previous Oceania ships make a return appearance on the Marina: Toscana and Polo Grill, both on Deck 14 aft. Amid a backdrop of three illuminated, etched glass panels, Toscana is an Italian restaurant serving food like grandma used to make. That's not surprising as many Toscana recipes -- such as the "gnocci al pesto" appetizer -- were handed down to the restaurant's crew members by their Italian parents and grandparents. Many sommeliers at Toscana also are descendants of wine-producing families so they intimately know just the right vintages to serve with particular dishes. For a different taste at dinner, Polo Grill is Marina's traditional steakhouse. With color accents of crimson, gold and green, the restaurant exudes a warm, yet elegant aura. Guests dine while seated on comfortable leather upholstery chairs (as shown at left*). 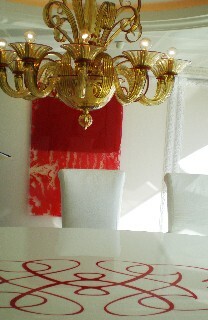 Decor elements include gold-edged mahogany wall panels. What's on the menu? 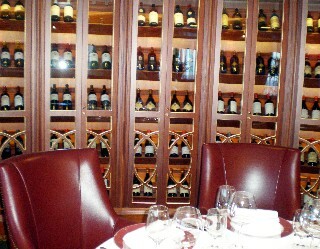 Polo Grill serves prime cuts of aged beef that are aged for 28 days, as well as fresh seafood and chops. Both Toscana and Polo Grill are open for dinner and reservations are required. But, there's no extra charge as on many other ships with alternative dining venues. Reservations for these and other alternative restaurants may be made at a desk in the Atrium or at each restaurant. A culinary novelty on Marina is Jacques, the first restaurant at sea named for celebrated Chef Jacques Pepin. Located on Deck 5 amidships, it's reminiscent of a Paris brasserie and serves French-inspired cuisine. A brass-and-glass rotisserie showcases veal roasts, pork and other meats -- cooked slowly for optimum tenderness. If you're into comfort food, try the "Coquille St. Jacques" or "Steak Frittes." The latter is sirloin steak with fried potatoes -- sure to please any “meat and potatoes" lover. Interestingly, the art gracing the room is either by Pepin or from his personal collection. Across from Jacques is another new venue for Oceania, Red Ginger, which serves Japanese, Thai and Vietnamese specialties. Diners are welcomed into a contemporary Asian setting with decor accented by carved, backlit Buddhas. We enjoyed the summer rolls, Chilean sea bass and crème brulee with chocolate and lemongrass. Both Jacques and Red Ginger are open for dinner only. Reservations are required. Two casual dining venues -- Terrace Café and Waves -- are ideal for a bite or a meal before setting out on shore excursions. Located aft on Deck 12, it also features a carving station, omelets made to order, create-your-own-pasta station and a pizzeria. In the evenings, it serves Mediterranean-influenced casual dinners – just the right place for a casual, delicious dinner after exploring a port of call. For lunch, Waves is an al fresco grill offering gourmet burgers, grilled chicken, swordfish and other grilled items. It also has a salad bar. Homemade biscotti, coffee cake, espressos and cappuccinos are special treats at Baristas on Deck 14. 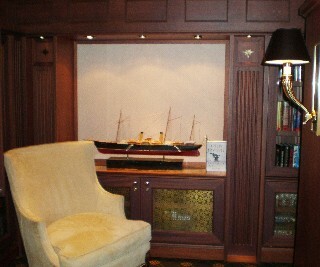 This coffee cafe is convenient to both the ship’s library and Oceania@Sea. Marina also features two specialty private dining venues -- perfect for special occasions such as an anniversary. The 24-seat La Reserve by Wine Spectator, on Deck 12, serves seven-course dinners with wine pairings selected in consultation with Wine Spectator magazine. Menus change daily. There is a charge of $89 per person and reservations are required. With a posh red, gold and white scheme (shown at right*), Privee, on Deck 14, is a private venue. Price tag is $1,000 for the room. Up to 10 guests may request their own seven-course menu and feast, degustation-style. Guests will enjoy such gourmet delights as Kobe beef, Brittany lobsters, foie gras, caviar and truffles at a gleaming white table lit by a Venini crystal chandelier. Privee is open only on select nights. Reservations are required. And, if all these venues for satisfying an appetite were not enough, the ship offers complimentary 24-hour room service for snacking here and there. Guests might order a burger or turkey sandwich mid-afternoon, cheesecake for dessert in bed or coffee and pastries for breakfast. La Reserve By Wine Spectator sets the scene for wine tastings each voyage for up to 36 guests. Prices vary and events are listed in the Currents daily program. Martinis, on Deck 6, is the place to go for lovers of this classic drink. You'll find every imaginable incarnation of it. And you'll enjoy a martini with a side of piano music. 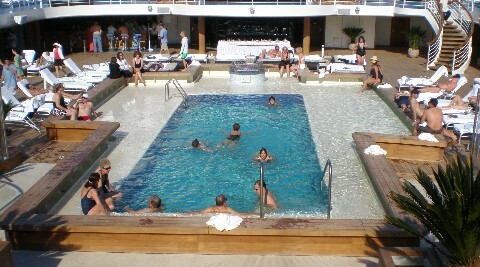 The ship also has a bevy of other lounges including the pool bar. 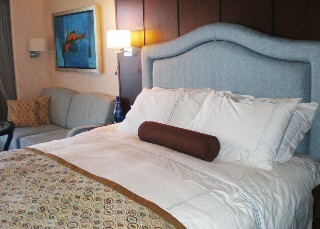 There are 625 staterooms and suites to choose from on Marina – 96 percent of them are outside accommodations. 124 Penthouse Suites -- each 420 square feet. Beyond the spacious accommodations and lavish suite decor, amenities in suites include champagne upon arrival, a 42-inch plasma television, Bvlgari and L’Occitane bath amenities and butler service. Suite occupants also have access to their own exclusive lounge. 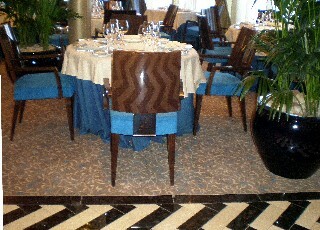 And, guests staying in Owner’s, Vista and Oceania Suites may order room service from any of the ship’s restaurants. 14 Interior Staterooms --174 square feet. On a recent voyage, I stayed in 9117, a Concierge Category stateroom. A bottle of champagne welcomed us and I loved the pampering Tranquility Bed with 1,000-thread-count linens (as shown at right*). Guests in this category stateroom easily relax and get into the cruising mindset with plush robes, slippers and Bvlgari toiletries. Our living area had a nice-sized flat-screen television. In the bathroom, we enjoyed a full-size bathtub, hand-held Grohe showerhead and rain shower in a separate shower enclosure. A mini-bar held complimentary -- and unlimited -- soft drinks and bottled water. Thoughtful stateroom touches include a clock and umbrella for use during the voyage. We used our private veranda often -- enjoying a room-service breakfast there twice. Concierge Category cabins have access to a dedicated concierge lounge. Perks include a television, reading materials, two computer terminals and a refrigerator stocked with sodas and mineral water. This concierge lounge also has a fabulous coffee maker for cappuccinos, lattes and other coffees. 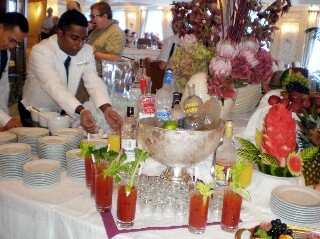 Service throughout the ship was warm and attentive during our three-night preview sailing. While I realize that the experience is not a "regular" cruise, it did give us a taste of the ship's amenities and service standards. Katya, our stewardess from Belarus, was efficient and friendly. From my perspective while dining in specific restaurants, the staff members in the Main Dining Room, Terrace Café, Red Ginger and Jacques were exceptional. My husband Humberto and I were quite happy with the Continental Breakfast offered in the cabin (cereal, juices, yogurt, muffins, breakfast rolls, pastries, fruit, coffee, tea and other beverages). But some passengers sailing on an upper premium line might expect a choice of such hot dishes as scrambled eggs and bacon -- or other breakfast favorites -- when ordering room service. We were informed that a hot breakfast would be available from room service only for guests in concierge cabins and in suites but not those in other staterooms. A magnifying, make-up mirror would be a welcome addition to the bathroom. And I felt better lighting for reading would be a plus in the library. Marina offers Panama Canal voyages and Caribbean cruises from the Port of Miami this winter. 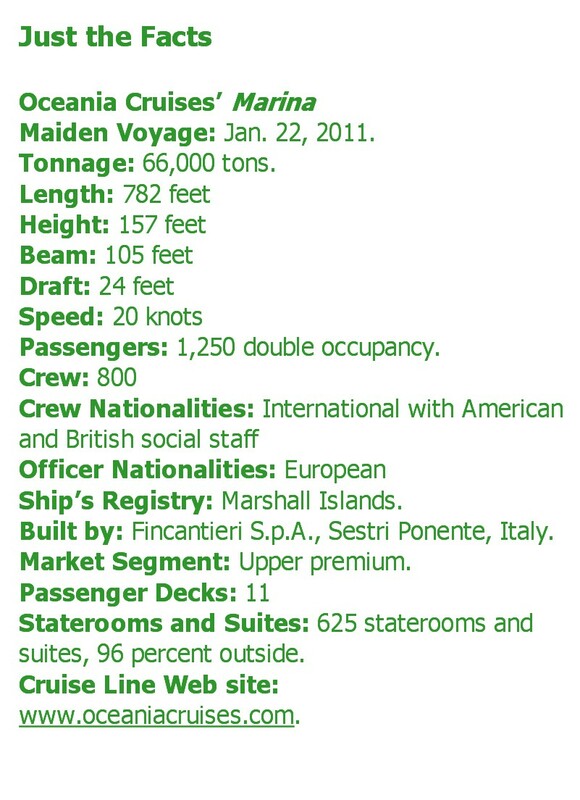 The ship repositions to Europe for summer 2011 and then returns to Miami for the 2011-12 winter season. Oceania features port-intensive voyages and rather long stays in port. Its itineraries have very few sea days except, of course, on trans-oceanic voyages. A variety of destination-focused shore excursions are offered at every port. Booked passengers may be reserve those shore trips online. During our port call at Nassau, for example, the ship offered nine excursions. Among them were a glass-bottom boat excursion, marine mammal encounters and a private island getaway. Georgina Cruz is a freelance travel writer with more than three decades of experience covering the cruise industry. Her work appears in regional, national and international publications. She has sailed on 167 voyages and counting. * Photos are owned, copyrighted and used courtesy of Susan J. Young, SouthernCruising.com ™, SouthernTravelNews.com ™, the author of this article or cruise lines and travel entities mentioned in this article. All rights reserved. Do not copy or utilize these photos in any way. Thank you.